Viewing topic "conecting moxf8 with ableton live"
i have a moxf8 and i have a midi conection with my ableton live DAW and i can record the midi signal from the moxf8 already, but without a sound. just with a sound plug in in ableton, i get a sound. But now i also want to record the full sound of the moxf8 in my DAW as midi data. how can i get this? The sound of the MOXF8 is audio, not midi, if I’m not mistaken. You need to bring the audio from the L+R audio outputs into Ableton Live via an audio interface. (Connect an audio interface to your computer, open Ableton, configure your Audio settings to recognize the audio interface). Open up an audio track (not a midi track) in Ableton live and set the I/O to match whatever inputs you are using on your audio interface for the MOXF L+R outputs. Record-arm the Ableton track and you should see signal coming in. You can then record directly into the Ableton audio track. 1) What computer platform and operating system are you running? 2) Have you installed the Yamaha Steinberg USB Driver appropriate for that computer? 3) Have you selected the MOXF as Audio Input and Output Device in Ableton Live Preferences? If needed, see https://usa.yamaha.com/support/updates/index.html?c=music_production&k=MOXF for the correct YS USB Driver. But, for the definitive answer you should post on the MOXF blog at the yamahasynth.com forum. BadMister (Phil C.) will set you on the right course. He is great and extremely helpful provided you explain what you are trying to do. I didn’t mean to imply that you need to post over at yamahasynth.com, as 5pinDIN is also a great resource in my experience. i would like to know, if this is principle possible or with which keywords i have to search on the internet :D. i found lots of things, but nothing, which describes what i want. My impression was that you wanted to record audio from the MOXF in your DAW. Is that correct? If so, that can be done - the MOXF can provide audio via USB, as long as the proper driver is installed and the DAW is properly configured. I don’t use Ableton Live, so I can’t provide detailed information on setting it up. One thing I can think of is port setup. Make sure that you’ve selected Port 1 for audio in and out - it will probably be shown as MOXF8-1 if your MOXF is being recognized correctly. Hopefully another member can help with other details. Otherwise, it would be helpful if you can explain in a bit more detail what isn’t working. But now i also want to record the full sound of the moxf8 in my DAW as midi data. how can i get this? I read it another way. It sounds like you have already been using an instrument track to play a VSTi with your MOXF and you want the same kind of thing for your MOXF’s internal sounds. A midi track set to channel 1 and MOXF Port 1 is all that’s needed in Ableton if you only want to record midi data and use it to play back sounds from your MOXF. If you want to do this with multiple MOXF sounds all at once, then you need to put the MOXF in a multi timbral mode such as Song or Pattern Mode. If you just want one sound then Voice mode is fine. Now that, thanks to philwoodmusic, the issue has been clarified, perhaps the cause of the problem has also been revealed. 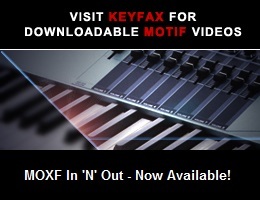 The MOXF plug-in is VST3. Ableton Live 9 and earlier versions didn’t support VST3, and I believe that’s also the case for Ableton Live 10, the most recent version. If anyone knows that’s no longer the case, please post. When I said VSTi, I was speaking broadly about soft synths, or virtual instruments and not specific DAW plugin formats. Sorry, my bad, but you are absolutely correct. I have another idea though, and I don’t think it concerns the editor plugin at all. I’m wondering if the OP actually has the MOXF’s Left and Right analog outputs connected to suitable amplification and considers JUST the USB connection between MOXF and computer enough to do the job, when it isn’t. It could well be that when the OP was previously playing a virtual instrument in Ableton with the MOXF via USB MIDI, that the audio from that was in fact coming out of a computer sound card or other audio interface and not the MOXF. So, faced with the idea of setting up a MIDI channel for the MOXF in Ableton, he of course doesn’t hear anything because the MOXF isn’t connected to amplification. No problem, we’re all seemingly handicapped by lack of sufficient information. That conjecture seems as plausible as any other in this thread. It would be helpful if hamham described how his MOXF, computer, speakers, etc., are configured, and what the expectations are. There’s been similar posts like this in recent times, so it’s my only plausible conjecture. Quite a few people have decided not to use the analog outputs on the MOXF because there’s a USB connection available and they assume that it must be a better way of hearing the MOXF. I think it’s just a habitual computer way of doing things, a kind of autopilot based on convenience. You can get toasters with USB ports, but the toast doesn’t come out of them and nor would it taste good if it did. I drawed my Hardware Set-Up and i hope you can help me a little bit better with this..